This story arc of Yona of the Dawn examines issues of geopolitics and addiction, along with Yona’s growth into someone who inspires others to do their their best. Yona gets injured defending her new friend Riri. Sinha appears just in time to rescue her, and as she recuperates Hak is constantly by her side. Yona being Yona, as soon as she is slightly mobile she decides to continue her mission to track down the source of the drug trade that is decimating the Water Tribe. 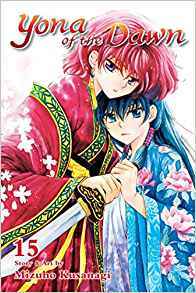 Seeing Yona’s determination, Riri challenges herself to do what she can as well, stealing her father’s seal of authority and traveling to the coastal city of Sensui. Riri’s overtures of friendship to Yona as they part ways are adorably awkward, as she shoves a box of sweets at Yona and attempts to help her with her sash. One of the reasons why I like Yona of the Dawn so much is the way Kusanagi builds in short character development moments into a larger, more complex story. Seeing Riri on her own standing up for what she believes in shows the depth of Yona’s influence. Jaeha has a few quiet moments with Yona that show how much of his breezy womanizing persona is actually an act. The larger conflict between Yona and Su-Won appears again, as their paths continue to intersect as Yona’s actions on behalf of the people intersect with his travels through his kingdom. Kusanagi is building up to a dramatic confrontation, and while I have no doubt that Yona and her companions will eventually leave the country of the Water Tribe in better shape than it was when they arrived, seeing the pathway to fixing the problems of the people is what makes this series so consistently interesting.